The progressive rock boom of the late 1960′s and early 1970′s produced its own pantheon of superstars — Keith Emerson and Rick Wakeman at the keyboards, guitarists Robert Fripp and Bill Nelson, and Chris Squire on the bass come to mind. 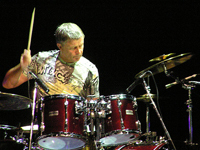 Among the drummers in the field, Carl Palmer stands out as the best known of them all — he has peers within the genre, to be sure, including Michael Giles, and at least one rival, Bill Bruford, who transcends the field, but Palmer is easily the biggest name, principally by virtue of his work with Emerson, Lake & Palmer, although he’s had successes in other contexts as well. Palmer was born in England’s West Midlands in 1950, placing him among the youngest members of his generation of art-rock musicians. He was at best an indifferent student within the context of formal education, a frequent truant who preferred to practice his drums, and he was serious enough to take — and his parents sufficiently supportive to pay for — lessons with a proper teacher in London. He reached his teens just as the Liverpool sound started sweeping the country; he was a fan of The Beatles, but already Palmer had musical idols far removed from anything that had come out of the Cavern Club and other Merseyside venues — Buddy Rich, whom he came to know personally, brazenly showing up at his hotel on one occasion when the American legend was on tour in England; Philly Joe Jones, Art Blakey, Gene Krupa, and other figures out of jazz and the big-band swing era. He also listened to a lot of r&b and was a formidible player when he joined his first professional group, originally known as the King Bees but later rechristened the Craig; a Mod outfit par excellence, they were a solid r&b-based band, and on their first record, “I Must Be Mad” b/w “Suspense”, Palmer — all of 16 years old — revealed a prowess that might’ve made Keith Moon (who was practically a drumming god among mortals), if he’d been listening, start keeping an ear pointed in his direction. Palmer also managed to intersect with the Merseybeat sound on at least one occasion that year, playing a session for a single with the black Liverpool singing group the Chants. At that point in his life and career, Palmer could easily have gone the route of such players as Jimmy Page or fellow drummer Clem Cattini, into work as a session musician, which was both lucrative and steady — possibly even more so than lead guitarists, session drummers were essential to most producers’ work when it came to recording new or relatively untried groups (especially on their singles) during this period, and Palmer could easily have put himself into that talent pipeline, alongside the likes of Cattini, Bobby Graham, John Bonham et al. In an interview with Alan Robinson for the notes for the double CD Anthology (2001), however, Palmer recalled that his father saw more ahead of him in music than simply playing on sessions for other musicians, even for top fees, and urged him to resist that temptation and avoid that career choice. He found a steady gig easily enough with Chris Farlowe’s backing band the Thunderbirds, playing alongside Albert Lee et al for a couple of years, and following this with a stint in the Crazy World of Arthur Brown. Out of that, and his friendship with keyboard player Vincent Crane, he co-founded Atomic Rooster. The latter group, along with such outfits as the Nice, bridged the gap between psychedelia and progressive rock, sometimes with impressive results, and at times sounded almost like an Emerson, Lake & Palmer prototype. In the interview with Robinson, he recalled that it was while working with Atomic Rooster that Palmer realized that he liked working with small groups, preferably a trio — he got to open up his playing and try doing some of the things that he’d long admired in the work of his idols like Buddy Rich and Art Blakey. In 1970, following his exit from Atomic Rooster, Palmer managed to cross paths with Greg Lake, a bassist/guitarist/singer who was a refugee from the first line-up of King Crimson, which had split up after (almost during) their first American tour; and Keith Emerson of the Nice, who’d split with his group amid a chaotic year that saw the collapse of their label, Immediate Records. In a sense, Palmer was the vertex of the triangle formed by the three personalities, a Beatles fan and a pop-rock listener like Lake, but also a jazz enthusiast like Emerson. Within a year of their debut in the summer of 1970, Palmer had become one of the most idolized rock drummers in the world, the group’s debut album showcasing a level of speed, dexterity, and taste that was wholly removed from the kind of playing — by the likes of Keith Moon in The Who, John Bonham in Led Zeppelin, or Charlie Watts in The Rolling Stones — that had previously captured the ears and imagination of rock listeners. This was playing — especially on the instrumental “Tank”, and the extended bridge of “Take A Pebble”, but also woven through “The Barbarian” — of a kind with which jazz listeners were familiar, and classical audiences could understand, but it completely dazzled rock audiences. And when the group toured, and Palmer showed that he could also do this on stage, he was suddenly a major lure for their concerts. He also demonstrated precisely how formidible he could be on the creative side when it came to recording what became their second album, Tarkus. The title track grew out of a piece of music that Palmer devised around an incredibly complex time signature and Emerson elaborated, into a side-length conceptual piece that became a major part of their concert repertory. He only had a couple of rivals during this period, Michael Giles of the same first incarnation of King Crimson whence Lake had come, and Bill Bruford, of Yes and a slightly later version of King Crimson, and Palmer was more extrovert as a musician than either of them and enjoyed by far the biggest public reputation — it wasn’t unusual for his fans to compare him with his longtime idol Buddy Rich, with whose band he sometimes played. Following a string of ever-more ambitious (some would say pretentious) albums, culminating with Works, which gave Palmer the chance to write and produce the music on a whole side of an LP, the group split up, principally due to the changing musical aspirations of its members, who wanted to express themselves independently of each other, and amid a precipitous decline in their popularity as the 1970′s drew to a close. Palmer landed in PM, a band formed with guitarist/singer John Nitzinger, whose ranks also included Todd Cochran on keyboards and vocals, Barry Finnerty on guitar and vocals, and bassist/singer Erik Scott — they were a decidedly more pop-oriented band, and cut a single album, One P.M., for Ariola in 1980 before breaking up. He found considerably greater success in 1982 as a member of Asia, a supergroup whose other members came from the ranks of Yes and King Crimson. “Heat of the Moment” became their signature tune and a huge international hit; with a platinum record behind him for 1980′s enabling him to step away from Emerson, Lake & Palmer in the public mind, Palmer was able to concentrate more on pure music-making in his next group, The 3 Project. The latter, dating from the late 1980′s, also included Keith Emerson but allowed both musicians a chance to work on music in a decidedly less formalistic, more popular context.